ThereÂ is no question about how appetizing a hot dosa plate can be. Especially when you have all the side dishes like coconut chutney, or a spicy sambar. 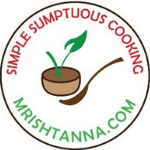 I am talking about Methi-Fenugreek Dosa Recipe. Did you know that you canÂ pack in tons of nutrition like Iron, Calcium and vitamins? A little known seed called Fenugreek seeds does the trick. Fenugreek Seeds a.k.a Methi in India, is another powerhouse of nutrition. A handful of these seeds is all you need to make a big difference. It is known to reduce blood cholesterol and control sugar levels.Â Methi- fenugreek dosa is one my favorite dosa for its taste and nutrition. My mother used to make thisÂ often and I learned it from her. As for theÂ procedure, it is as simple as it gets although it needs 8-10 hours of prep time for the batter to ferment. Check my video in this post. Note that I only add a tablespoon of the methi seeds. I also tried mixing in a little brown rice with the long grain rice to balance out the glycemic index. YouÂ couldÂ also try it with just the long grain rice. It isÂ primarilyÂ theÂ Methi seeds that bring a unique flavor and texture to the dosa.Â A spicy chutney or sambar goes well with thisÂ dosa. When youÂ letÂ the batter to ferment, be sure to store in a warm surrounding. As the fermentation cycle complete, you will have to add salt. Be sure not to add the salt before it ferments….but I think you already knew that. Soak all the ingredients (except salt) for 5-6 hours. Heat the dosa griddle with a little oil and spread the batter. After one side is cooked, flip it around and spread a thin layer of oil again. Sprinkle a little Chutney powder for added flavor. This is great! I’ve always wondered how to make dosa. Thanks Uma! I’ve never been a huge methi fan, but i have a feeling i’d like it in dosa! Love this recipe…need to try it sometime, especially with my mom who loves methi! Thanks Anjali:) I am sure you will like it! I love the flavor of fenugreek! These look so good – and healthy too! I do add methi seeds to dosa but your recipe is different. I need to try this version. Thanks for sharing.